After flying in helicopters over two areas in Utah’s West Desert, Divis ion of Wildlife Resources biologists have some exciting—and unusual—news to report: the number of chukar partridge in north-central Tooele County is close to a record high. And the number in central Box Elder County is the highest since surveys started there in 2009. OK, it’s easy to see why that news is exciting. But why is it unusual? Jason Robinson, upland game coordinator for the DWR, says the number of chukars in Utah usually spikes every eight years. The year following a spike, chukar numbers usually plummet. In north-central Tooele County, biologists counted 101 chukars per square mile in 2015. That was second highest count on record. During a survey on Aug. 26, 2016, they counted 95 chukars per square mile. That’s the fourth highest on record. In central Box Elder County, chukar numbers actually climbed from 2015. In 2015, biologists spotted 26 chukars per square mile. During a survey on Aug. 23, 2016, they counted a record high for the county: 34 chukars per square mile. Robinson isn’t certain why chukar populations didn’t follow their normal pattern of crashing a year after spiking. He thinks, though, that the weather might be a factor. He says weather conditions for chukars have been ideal over the past nine months. The ideal conditions started last winter, when plenty of snow fell early in the season. (Good snowfall is critical to providing birds with green vegetation and insects months later.) Then, in late winter, the snow stopped falling and temperatures warmed. Those conditions allowed plenty of adult birds to survive the toughest time of the year. Next, lots of rain fell during the spring. The abundant moisture, combined with the moisture received earlier in the winter, gave newly hatched chicks lots of green vegetation and insects to eat. Robinson says flying surveys in Tooele and Box Elder counties give biologists, hunters and birdwatchers a great picture of how chukars are doing across the West Desert. “The West Desert has the best chukar habitat in Utah,” he says. Reports from DWR biologists in other areas of the state indicate chukars are doing well in those areas too. In addition to the chukar hunt, the gray partridge hunt also opens on Sept. 24. Gray partridge are found mostly on or near agricultural land in Box Elder County. Robinson says gray partridge numbers are up slightly from last year. Those 17 years of age and younger can hunt chukar and gray partridge Sept. 17, 18 and 19, during Utah's annual youth partridge hunt. After Sept. 19, the hunts will close until Sept. 24 when Utah's general partridge hunt, for hunters of all ages, opens up. Tip 1 - See the distribution map on page 36 of the 2016 – 2017 Utah Upland Game and Turkey Guidebook. The map will show you where chukar habitat is found in Utah. The free guidebook is available at www.wildlife.utah.gov/guidebooks. Robinson says Tooele, Juab and Millard counties have the highest concentration of birds in the state. "The state's best chukar habitat is found in the rocky, desert areas west of Interstate 15," he says. Other areas in Utah do hold plenty of birds, though. Robinson says the Book Cliffs in eastern Utah, and rocky river corridors in southern Utah, are some of the best. "And every year, hunters do take birds in the rocky foothills along the Wasatch Front," he says. Tip 2 - After arriving in an area that might have chukars in it, focus your efforts on steep, rocky slopes that have cheatgrass, bunch grass or sagebrush on them. These rugged, cheatgrass-covered slopes provide ideal habitat for the birds. Tip 3 - Because chukars are very vocal, early morning is the perfect time to hunt them. "The birds feed mostly in the early morning," Robinson says. "If you listen closely, they'll often tip you off to their location." Robinson says chukars live in coveys that typically number between five to 30 birds. "When the covey is feeding," he says, "it always posts a sentry. The sentry sits on a rock that provides it with a good view of the surrounding area. If the bird sees you, it will call out to alert the other birds. There's a flip side to that, though: the sentry's calling will alert you that a covey of chukars is in the area." Tip 4 - Finding a water source is a good idea, but chukars aren’t completely reliant on water, even early in the season. A good idea, early in the season, is to hunt the steep slopes that are above a water source. "As the season progresses," Robinson says, "water becomes less important to chukars. Hunting near a water source isn't as important later in the season." Tip 5 - When winter arrives, hunt slopes that face south. "The sun beats on these south-facing slopes in the winter," he says. "That warms the rocks, melts the snow and attracts the chukars." After finding some birds, remember that chukars almost always run uphill to escape danger. "You can't outrun them," Robinson says, "so don't try to chase the birds up the slope." Instead, try to cut off the birds' escape route by circling around the birds and getting above them. Then, hunt down the slope towards them. "If you get above the birds," he says, "they'll usually stay where they are until you get close enough to shoot at them." When chukars flush, they almost always fly straight out from the slope before hooking to the left or the right. "Get your shots off while the birds are still in range," he says. After hooking to the left or right, any bird that isn't bagged will typically fly into a group of rocks, into sagebrush or into bunch grasses. If you watch where the birds land, you'll often have a chance for another shot. Because of the steep, rough areas where chukars live, it's important to be in good physical shape. When you go afield, make sure you wear sturdy boots that provide your ankles with plenty of support. "It's also important to carry plenty of water," Robinson says, "especially during the early part of the season." Five reasons to hunt upland game If you're not currently hunting upland game in Utah, Robinson provides five reasons to consider giving it a try. You can read his list at www.wildlife.utah.gov/blog/2015/top-5-reasons-to-hunt-upland-game-in-utah. Upland Game Slam If you'd like to add some fun to your hunt, consider participating in Utah's Upland Game Slam. One of the slams—the Blister Slam—will reward you for taking a five chukar limit in a single day. 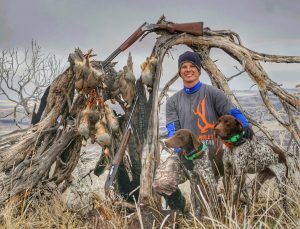 You can learn more about the Upland Game Slam at www.uplandgameslam.org.